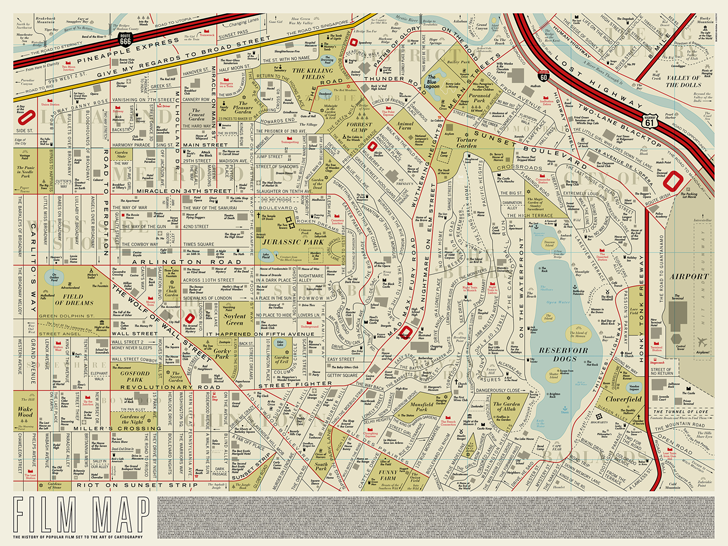 There are movies named for L.A. streets (Sunset Boulevard, Mulholland Drive) and there are L.A. streets named for the movies (True Grit Place in Diamond Bar, Astaire Avenue in Culver City), but this Film Map of Los Angeles takes things to the next level. Created by UK-based design studio Dorothy and drawing inspiration from old-school maps of Los Angeles, it reimagines L.A. with every single street, park, lake, and landmark named after a film. Silver Lake Reservoir becomes Reservoir Dogs. The 5 freeway becomes Lost Highway. The Westside becomes West Side Story, and Chinatown is named for, yeah, Chinatown. The map is more impressionistic than accurate, so don’t be surprised by the airport east of Glendale Boulevard, where an Airplane! taxis on the Hit and Runway outside of The Terminal. 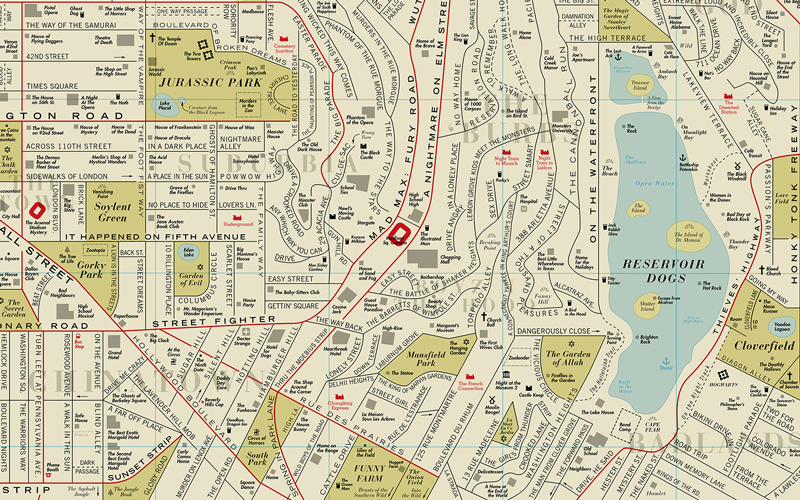 You could easily get lost among the assorted Broadways on the left edge of the map (Angels Over Broadway, Babes on Broadway, The Broadway Melody etc. etc.) or the Harry Potter landmarks in the bottom right corner (Hogwarts, the Leaky Cauldron, and Diagon Alley). Public transit gets its fair share of callouts, what with stations named Strangers on a Train, The French Connection, The Deserted Station, and The Polar Express. If you were to visit this version of the city, we’d recommend a stroll through the lushly wooded Forest Gump and maybe a dip in the Deadpool. Just be sure to avoid Mad Max: Fury Road, where, presumably, traffic is a doozy. Bet you can’t find The Ghost Train. Previous articleWait. Is It Really True That the Queen Mary Is Sinking?